You are here: Home / Uncategorized / Meet Movere’s Partner Account Manager, Rian Nanthrup! 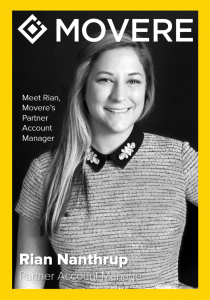 Meet Movere’s newest Partner Account Manager, Rian Nanthrup! Rian has worked for Movere for a little over a year but recently started shifting her focus from the operations side of our business to sales and partner management. In her first official quarter in sales, Rian blew her goals out of the water achieving 350% of target! We can’t wait to see what she does next. We asked a few questions to see how Rian embodies our company values in her day to day. Fit Radio – “DJ mixes within more than 40 different music genres that suit your favorite workouts.” One of my favorite quotes is “Life isn’t about waiting for the storm to pass…It’s about learning to dance in the rain. …” This quote is great metaphorically as well as literally! Music and dance have always been a huge part of my daily life. I am definitely not always working out, but Fit Radio is great anywhere anytime! One of the most enjoyable customer service teams to work with is at Le Tote. “Le Tote is a rental fashion service that lets you wear the clothing and accessories you choose. Just wear, return, repeat.” I have been subscribing to Le Tote for over 4 years now and every time I have ran across an issue, not only do they respond quickly, but always make it right. One past experience comes to mind where 2 of the 5 items I should of received in my tote were missing. I emailed the customer support team and within a few hours, received a response. Not only were they very apologetic, but they offered to add a credit to my account for future purchases. They resolved the issue quickly and left me feeling righted, even though I was missing out this shipment. Backstreet Boys! – Sorry not sorry I was a 90s child! I am more of a chocolate chip pancakes kind of girl! I am passionate about organizations that focus on the betterment of women and children. I am a huge advocate for the empowerment of women in and out of the workforce. I also thoroughly enjoy donating to toys for tots!